A Garden City, Kansas child custody case could become a flashpoint in Kansas' growing cultural clash over cannabis. Banda’s case could become a flashpoint in Kansas’ growing cultural clash over cannabis. So far, that clash is perhaps best encapsulated by Wichita residents voting this month to decriminalize possession of small amounts of marijuana despite warnings from the state attorney general that it would violate the state’s prohibitions on the drug. The debate over medical marijuana is not going away. There’s mounting evidence that the cannabis oil derived from the marijuana plant has some benefit for children who suffer from debilitating, hard-to-treat seizure disorders. Earlier this year, a bill narrowly tailored to allow access only to that oil and only for seizure disorders became the first medical marijuana legislation to gain committee approval in Kansas. But it has since stalled, and it’s unclear whether Banda’s case will make lawmakers more or less likely to take it up. Early media reports had Banda being arrested for possession of just 2 ounces of cannabis oil. But the Garden City Police Department said no arrests have yet been made, and investigators found more than that in Banda’s home. According to police, the child was taken into protective custody after a search of the home turned up 1.25 pounds of suspected marijuana, a lab for manufacturing cannabis oil, drug paraphernalia and other items. Garden City Police Department Captain Randy Ralston said officers searched the home on March 24 after the 11-year-old child said during a school drug and alcohol presentation that his mother and other adults in his home used marijuana. Ralston said officials at the Bernadine Sitts Intermediate Center contacted the Kansas Department for Children and Families and DCF performed a child welfare check and reported its findings to police. Police opened their own investigation as a child-in-need-of-care case, which led them to the residence. According to police, Banda denied their request to enter her home, so officers applied for a search warrant and remained at Banda’s house to prevent the destruction of evidence until they were granted a warrant. The suspected marijuana and other items tested positive for THC and were sent to the Kansas Bureau of Investigation for more testing. All were within easy reach of the child, police said. No arrests have been made. The police investigation is complete and has been forwarded to the Finney County Attorney’s Office. Finney County Attorney Susan Richmeier's office will determine whether charges will be filed against Banda or others. The Garden City Police news release said suspects could face charges of possession of marijuana with intent to distribute, felony possession of drug paraphernalia, misdemeanor possession of drug paraphernalia and endangering a child. Before the investigation was complete, social media users began criticizing the Garden City Police Department for how it handled the situation at Banda’s home, citing a video that appears to have been taken by Banda. Ralston said police handled the situation legally, it wasn’t considered a high-risk warrant and a standard number of officers were on the scene. Garden City Mayor Roy Cessna said the school district cooperated fully with the investigation. Cessna refused to comment further on investigation details, but said the school district was following current state statutes and laws. Her case brings to Kansas a clash that’s also playing out in other states between police and state officials tasked with enforcing anti-drug laws and child protection laws and residents who are convinced that marijuana is harmless or even a medical necessity. In Minnesota, a mother who treated her 15-year-old son’s seizures with cannabis oil last week accepted a plea deal on child endangerment charges, but expressed anger at the state’s interference with the treatment and said she purchased the oil legally in Colorado. After the woman was charged, Minnesota lawmakers voted to allow cannabis oil use — a law that goes into effect July 1. The chief sponsor of a similar proposal in Kansas, Rep. John Wilson, a Democrat of Lawrence, said the Legislature needs to speak up soon on medical marijuana. Wilson said Colorado’s open marijuana policy and Missouri’s recent approval of a cannabis oil bill have created wide regional discrepancies in marijuana law. “Given that our neighbors to the west have been proactive on this issue and our neighbors to the east are proactive on this issue, it seems like Kansas needs to make a decision to provide some clarity for people,” he said. Wilson has been careful to distance his bill from the broader medical marijuana legislation proposed by fellow Democrats. His bill applies only to products so low in THC that they cannot produce the “high” coveted by recreational marijuana users, and it allows only those who suffer from persistent seizure disorders to access the products. Testimony in favor of Wilson’s bill came largely from parents who expressed desperation at the dozens of seizures their children suffer daily, despite traditional medical treatments. Some families, like the parents of Otis Reed, for whom Wilson’s bill is named, have moved to Colorado to access treatment legally. Opponents of Wilson’s bill said it would be just the first step on the path to full marijuana legalization and that those seeking cannabis oil treatments should wait on drugs currently in the U.S. Food and Drug Administration approval pipeline. Not following the FDA’s process of testing medications for safe and effective dosing guidelines leads to dangerously unregulated consumption, they said. Formal research on medical marijuana has been slowed by marijuana’s status as a Schedule One controlled substance at the federal level, and most reports of its health benefits are anecdotal. But a new study found that subjects with specific seizure disorders experienced an average reduction in their seizures of more than 50 percent after taking cannabis oil. The results of the study were unveiled last week at an American Academy of Neurology conference. 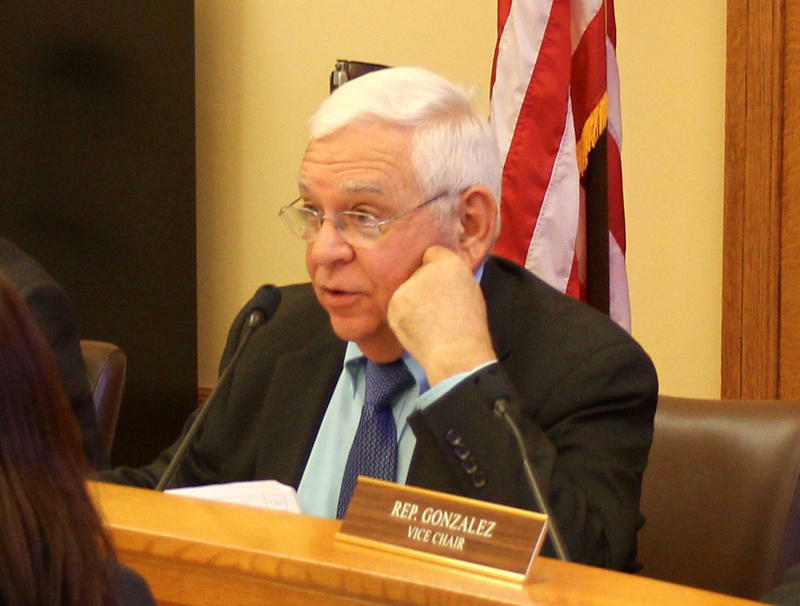 Wilson said his bill encourages pharmaceutical investment in Kansas cannabis oil, which could help it gain traction in the Republican-dominated Legislature. “It could be like so many issues: As soon as there seems to be a business angle for something, it might get some movement,” Wilson said. Families who testified for Wilson’s bill said they feared that if they obtained oil legally and brought it back to their Kansas homes, they too could run afoul of law enforcement or state child protection officials. Theresa Freed, a DCF spokeswoman, said the child’s welfare would be the agency’s primary focus. Freed told the Associated Press that DCF’s goal is to keep children with their families when the agency can safely do so. Last year, in a high-profile case out of Wichita, a child died in a hot car after her foster parents accidently left her there while smoking marijuana recreationally. Wilson said removing children from homes and placing them in the foster care system based on marijuana possession is another “War on Drugs” cost to the state that is rarely considered. He pointed out that other bills have been introduced this session to steer marijuana users toward treatment rather than jail time with the goal of lessening the more prominent costs of the state’s at-capacity prisons. Wilson also said there’s a pent-up frustration among medical marijuana advocates that is made more intense by the Legislature’s refusal to even vote on the issue. He said he’s fielding calls and text messages regularly from people who were excited to see his bill get out of committee, but are now disappointed to see it bottled up in the House. A full legislative debate and vote on medical marijuana could provide an outlet for some of those frustrations, Wilson said, but thus far those have been hard to come by because of marijuana’s political baggage. “You can’t have a candid and open discussion about marijuana,” Wilson said. Ashley Booker is an intern for KHI News Service in Topeka, a partner in the Heartland Health Monitor team. For the past month, Kansas Rep. John Wilson has told everyone who will listen that his medical marijuana bill is different. Wilson, a Democrat from Lawrence, proposed a bill to allow low-THC cannabis oil to be used specifically to treat seizure disorders. He was inspired to do so by parents in his district who moved to Colorado to access the treatment for their young son.